Hello again, folks. As you all know, this summer has brought some rather dire news on the climate front as unpredictable weather patterns have led to flooding in many parts of the world. And as climatological researchers and scientists have predicted, this is just the tip of the iceberg, as rising global temperatures will lead to melted icecaps, higher sea levels, severe droughts, wildfires and coastal storms. But as I always like to point out, there are solutions to these problems, or at least ways to mediate them. Given the central role played by overpopulation and urban sprawl in climate change, many of these proposed solutions have to do with finding new ways to house, feed, and provide from future generations – ones which emphasize sustainability and clean energy. When it comes to feeding future generations of people, the question of what will be on the menu and where it comes from are paramount. 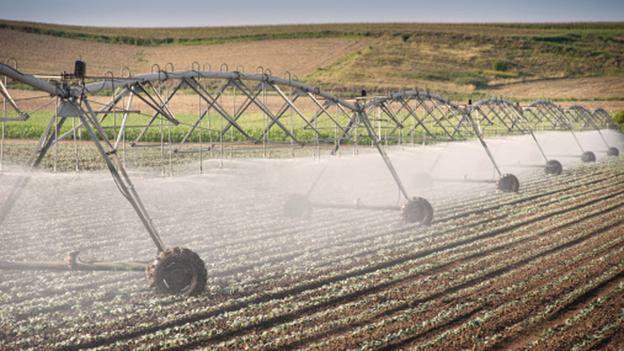 In recent decades, massive crop failures, protracted droughts, and numerous food-borne disease outbreaks caused by microbes such as salmonella, E. coli, toxoplasma and listeria have forced people to contemplate where their food comes from and how it is produced. The proposed solution is to rethink farming, moving out of the old paradigm of farming the lands around human settlements and moving them inside. 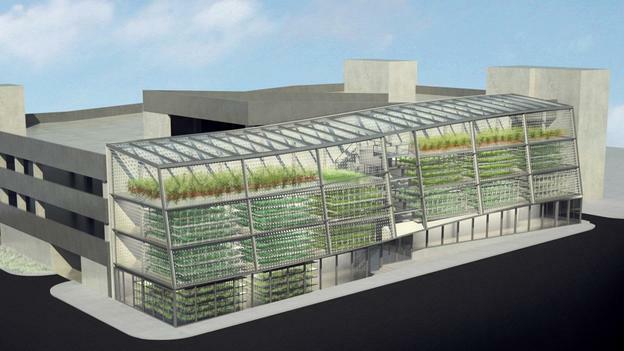 These city-based agricultural projects include rooftop gardens, rooftop greenhouses, planting beds, empty lots as farmland, and vertical farms that occupy tall buildings and abandoned warehouses. Collectively, these examples show the validity of growing food in the city. Not only could be they be carried out efficiently, but they could also operate without the pollution associated with outdoor farming. In truth, the concept is not entirely new, as “victory gardens” or other variants have been a means of producing agricultural goods whenever national farms found themselves overburdened. These were all the rage in Britain, Canada, the US and Germany during World War I and II when naval blockades and military demand forced people to plant their own vegetables in their backyards. In addition, after the collapse of the Soviet Union, Cuba found itself in a serious agricultural crisis. As a result, they turned to a vast network of ‘organoponicos’ – growing food for city dwellers in spare plots. These miniature agricultural operations not only staved off starvation and malnutrition during times of shortages, but became a model for sustainable local efforts that are currently being used around the world. For example, in Wilcox, Arizona, their is the EuroFresh Farms indoor-operation – a 318 acres (1.3 square km) of one-storey-high hydroponic greenhouses that supplies fresh tomatoes and cucumbers. Similarly, the FarmedHere operation in Bedford Park, Illinois consists of a 8,360 square meter (90,000 square foot) empty warehouse that is several storeys tall that produces tilapia, a variety of leafy green vegetables, and several value-added products. 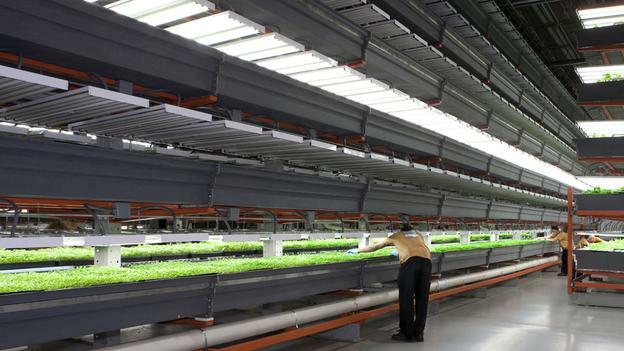 And in Sweden, the company known as Plantagon is building a vertical farm in the city of Linkoping, and has partnered with a Chinese company to research similar methods for the state of China. 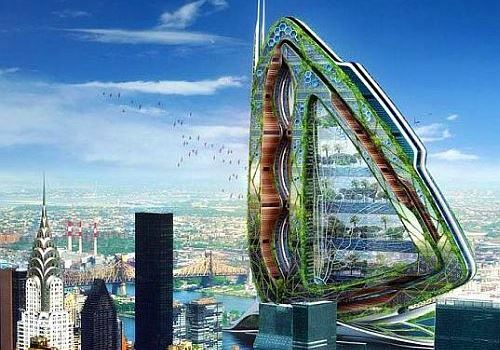 In addition, limited forms of vertical farming also exist in Japan, Korea, Singapore, the United States, and Canada, with new farms being planned for a number of cities in the United States. As always, technological innovation is assisting in the process. 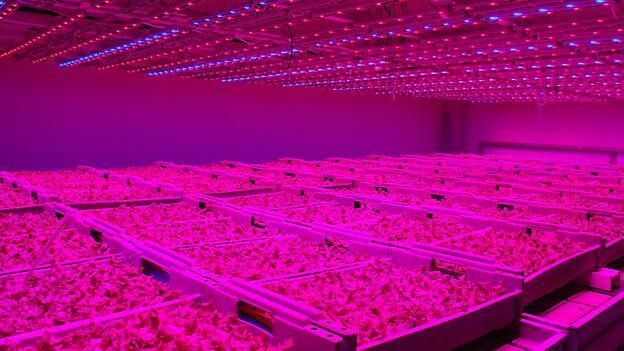 This includes such things as grow lights that have replaced expensive fluorescent fixtures with light-emitting diodes that can be adapted to emit light spectra tailored for growing green plants. In addition to costing less to run, their yields are demonstrably higher, especially where leafy greens and tomatoes are concerned. Another concept which is being embraced is aquaculture – indoor fish hatcheries – which could provide meat protein to go with all these vegetables. 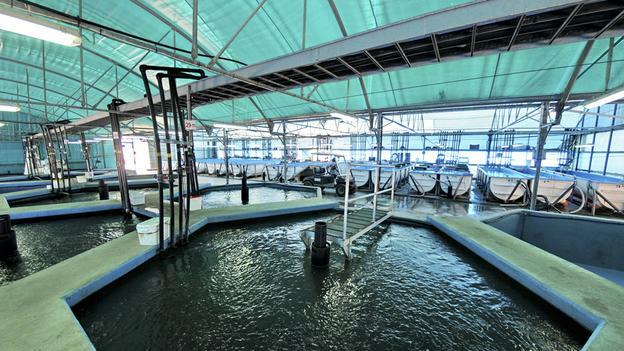 Such operations include Hazorea Acquatics, a koi farming operation, as well as the carp and mullet farm pictured below, both of which are located in Israel . Similar operations are popping up in the US, Netherlands, Denmark, Scotland and Canada, where barramundi, sturgeon, tilapia, eels, catfish, trout and salmon are being raised. Looking to the long-run, urban agriculture has the potential to become so pervasive within our cities that by the year 2050 they may be able to provide its citizens with up to 50% of the food they consume. In doing so, ecosystems that were fragmented in favor of farmland could be allowed to regain most of their ecological functions, forests could recover, and the impact on the environment would very beneficial, for the planet as well as humanity. In addition to ensuring that the greatest consumers of CO2 – trees and other flora – could re-advance on the landscape, allowing natural spaces to recover from the damages of agriculture would also bring countless species back from the brink of extinction. Loss of habitat is one of the chief causes of wildlife becoming endangered, and farm runoff is one of the greatest factors effecting our rivers and fish stocks.